It's no secret that we at GeekTech are fans of both Lego and robots. So when the two can come together in the form of a Lego Mindstorm NXT kit, color us interested. The Gymnastic robot is a pretty simple Mindstorm bot. It's attached to a bar, which it flips over, much like (surprise!) a gymnast. However, it also acts in a very human way. Rather than instantly being able to go straight over the bar, it rocks back and forth to gain traction to push it. It also has similar joints to a human (minus the legs), making for natural looking flips. Watch the video, and then download the manual to try for yourself. So, you're feeling lazy enough to get the Bartender bot above to fetch your drinks. But after having so many, you're feeling the need to go to the bathroom. Still feeling lazy? There's a Mindstorm robot to even flush the toilet for you. Will Gorman built Roboflush, the robot that sits on the side of your toilet and automatically flushes -- it has an ultrasonic sensor sitting on top of the lid. Read on to get the instructions to make this and see it in action (it's not a graphic video, I promise!). One way of really showing off to your friends would be to challenge them to a game of soccer, but with robots. Other than the Mindstorm kit, these autonomous football robots come equipt with a color camera, compass, radar and light detector. Combine all these gadgets together and these robots are quite nifty at tracking where the ball is on the pitch. There's no denying that robots can beat us at most things (like, say Jeopardy, or basketball), so it's no surprise that this robot by Danny Benedettelli can solve a Rubix Cube in under a minute. 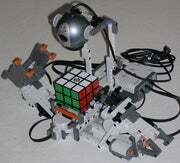 The puzzle solver grabs, rotates, and scans a Rubix Cube as it solves the puzzle. It features three motors, two touch sensors, and two NXT controller bricks. The software, which communicates with the robot via Bluetooth, can be found on Danny's page, as well as more photos, a video and how this bot has evolved. Are there are NXT robots you think are missing from the list? Tell us in the comments!